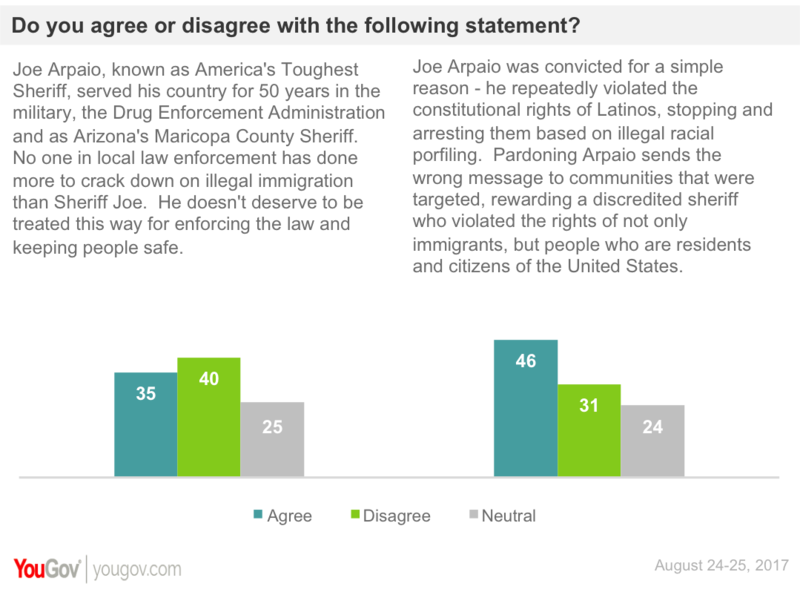 On Thursday and Friday, before President Trump pardoned former Maricopa county Sheriff Joe Arpaio, YouGov polled 1,000 Americans about what they thought should be done. 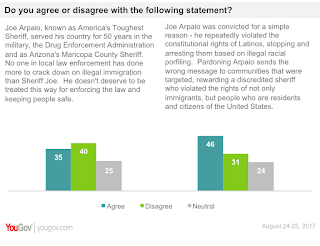 Before supplying any information about the details of the Arpaio case, 24% said they were in favor of a pardon and 37% were opposed. However, this is the type of question where opinion can change quickly as the public learns more about the issue. Despite widespread media coverage and Trump's hint of a pardon on Tuesday, a majority of the public said they knew "little" or "nothing at all" about the Arpaio case. To see what might happen if people were exposed to arguments for and against the pardon--as will inevitably happen--we asked our sample whether they agreed or disagreed with pro and con arguments. The pro-pardon wording was based on White House talking points. The anti-pardon statement mirrored language used by Arpaio’s opponents. Specifically, most of the movement was among respondents who had selected "Not Sure" in their initial opinion. Among Democrats and, to a lesser extent, Independents, these individuals moved to "Oppose." The opposite trend is observed among Republicans, though some people who were initially "Oppose" also appear to have moved to different columns. This presents a problem with regard to surveying about these issues. When addressing issues that are not well known, or where limited facts are available, it makes sense to include some background in opinion polling. But this highlights an important methodological issue - the way an issue is framed will certainly have an impact on responses (we've known this for a while), but including the "whole story" with two sides of an argument could also impact opinions, by leading to a group polarization effect. Notice what pushed many respondents to the poles of the continuum (a continuum with Oppose on one end and Favor on the other) was not that this was an issue addressed by current administration - which is in itself very divisive - but instead was the use of a partisan issue (illegal immigration) in the background information. As more and more issues are politicized, we're likely to see more and more of this group polarization effect. And that will make it even harder to find a common ground.